2 Oscillatorss that are "hybridly" filtered by real analogue filters (whats inside see the CHIPs section).the filter is a 24dB/oct LPF filter with resonance and a 12dB/oct HPF witout resonance. 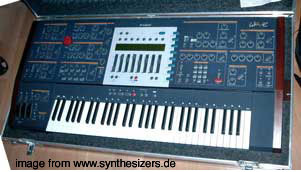 the curtis (filter) chips are rare, so waldorf discontinued the wave. a voice board was worth 2000€ new. 16 voices per expansion. the standard wave has 16 voices, max is 48 voices. but: 8 multis max! buuut: it really sounds more like a "wall", compared to the microwave, much broader and wider..
it still has one wavetable for both OSCs and can be set independently. note: like the mw1 it has no sync or fm and the old 3 bit mixer section (7 is max level). the internal software is able to analyze sound designer files (there is not much software ,that still can handle this format). like sounddiver does for the XT and mw2/mw1 with WAV files it is able to resynthesize up to 60 waves for a wavetable to form a "resynthesis-like" collection of static spectra. now do ,what the wave is made for: scan through the waves using the envelope. you hear some sort of lofi re-assembly of those spectra that form the sound. of course this does not work for all kinds of sounds: noisy or phasing sounds will not give you good results, but some do as a good basis for new sounds and re-construction of spectra. hard ware: inside the wave you'll find 2 waldorf asics , that were done by wlaodrf and wolfgang palm, who invented the ppg wave, the "father" of the wavertables. 16 x CEM 3387 VCF / VCA, filters, panning..
find lots of info on till koppers "unofficial wave site".. very good and written by a Wave OWNER! you can still get one of 300 Waves at about 6000-7000euro now. we HAD such a thread some moons ago.. 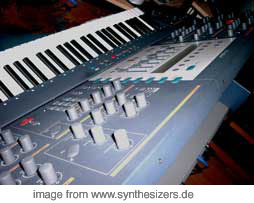 I posted a lot of wishes that could be on the Wave2 then..
be that high that you can do re-synthesis stuff..
strange modulations and very xpensive sounding new soundscapes..
the sampler sections has knobs,too .. it is a very diffent kind of sampler..
well... but maybe i should mention my coolest wish.. it should be modular.. Waves & modular stuff.. (please have a look at the other modulars, first!! 6 knobs sharing one display completely free..
filters.. , maybe the re-synthesis will make K2k like "free formant filter"
FX: all modable & CC able, reverb, delay, those already xisting Q&XT FX..
theiy are part of the sound.. not only the mix..
ok.. this is the first re-load of my idea stack.. I got more on my site and posted some more before..
it ,too) including a knob local off..
that sounds like an awfully xpensive machine..
well I'd think it would be ok if it is a pretty xpensive machine then..
there are a few more concepts to talk..
even develop such a nice machine at a nice price..
ok.. quite a lot for a start isn't it? I had to say ths: well Philip.. your list is very nice..!!.. USB.. but it is ok.. should be think future!!!.. I'd like a tracking generator (see xpander!),too!! I loved those chaos "somewhere between 20 and 35" generators..
and those cool waveforms for the LFOs..
of course real noise (and a knob from white to colored..),too..
what about a filterbank.. modulatable..?? & seen the sunsyn).. and have a morph for it..
what about a vectorstick for those 4 OSCs?? & an env for them..?? Waldorf Waldorf Synth overview.. Waldorf Synth Überblick..